Virginia is often associated with the word ‘first’ but that’s not the word you think of when you look at legal real money poker in VA. Jamestown, Virginia, was the first permanent English Settlement in what would eventually be known as the United States. The Virginia House of Burgesses was the first representative form of government in North America. And Virginia was the birthplace of the US’s first President, George Washington. However, it certainly isn’t the birthplace of real cash Internet poker gambling. Unfortunately, when it comes to online gambling and poker websites, the word most likely to be associated with the Old Dominion State will be ‘last.’ Ever since the first settlers arrived, Virginia’s state officials have been vehemently opposed to legalizing gambling, in any form, including poker betting. And although its stance towards opening land-based casinos and lawful poker gambling venues where VA residents can play games like Texas Hold’em poker has begun to loosen in the past several years, for the foreseeable future Virginians will most likely have to travel across VA state lines to get their online gambling real money Internet poker fix. Which is unfortunate, considering Virginia and its over 8.1 million inhabitants could support a healthy online poker website community. Bettors in The Old Dominion State will be happy to know that there is a wide selection of real money US poker sites to choose from. 2 Can Players from Virginia Play Poker Online? 3 Is Online Poker Legal in Virginia? Proponents of legalized gambling and legit real cash poker websites in Virginia suffered a crushing blow when the Virginia Supreme Court refrained from ruling on whether poker could be classified as a gambling game of skill . In 2010, Charles Daniels had his charitable poker betting hall shut down by Portsmouth Commonwealth Attorney, Earle Mobley. Daniels filed a lawsuit to overturn the ruling on his legal poker gambling venue, and brought in 2004 WSOP Main Event Champion poker betting pro Greg Raymer to support his case. Raymer informed the Portsmouth judge as to why poker was a game of skill. And although the judge acknowledged Raymer’s argument, he cited that Virginia law banned any and all wagering and real cash betting on uncertain outcomes, and ultimately upheld the ruling. Daniels brought the case before the Supreme Court, claiming that the law regarding the skill portion of gambling law was vague and unconstitutional and it wasn’t clear on what sort of game real money poker was. The court refused to resolve the skill issue, and dismissed Daniels’ case. Despite Virginia’s strict stance against commercial casinos and real cash poker rooms, finding a real money poker website that accepts players from the United States is fairly straightforward, just take a look at our home page where we cover the best real cash US poker websites in 2019. While most Virginians will be traveling to Maryland to play live real money poker, they’ll have little problem creating an Internet poker account with an online poker website, depositing funds via a credit card or MoneyGram and taking to the virtual felt at plenty of poker websites. The entire process should take no longer than five minutes. 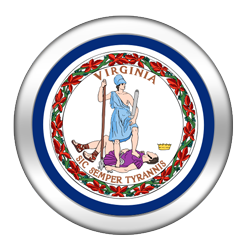 Legislation regarding the legality of online poker and Internet poker betting in Virginia resides in a murky gray area. At best Virginia’s real money poker gambling laws are outdated and vague. At worst, they’re downright contradictory, especially when it comes to gambling on legal Internet poker in VA. While we’re no legal authority on the subject of legit real cash poker websites, we have taken the time to thoroughly examine Virginia poker betting law, and can provide you with some clarity regarding its gambling and Internet poker statues. If anything, by learning the poker gambling laws you’ll be better prepared to ask a legal authority the right questions about how lawful poker websites in VA are before making the decision to play a few hands of Texas Hold’em poker online. According to Section 18.2-326 anyone found guilty of illegal gambling or poker betting will be charged with a Class 3 misdemeanor. Placing a bet and gambling on the outcome of a horserace outside of a racetrack licensed by the Virginia Racing Commission can result in a Class 1 misdemeanor. Virginia hates cheaters. Anyone caught cheating while gambling or poker betting is subject to a fine up to 10 times the amount won via the cheating. Ironically, Virginia gambling law permits social gambling, meaning its residents are free to host home poker games of real cash Texas Hold’em, in so long as a rake is not being taken. Considering it was the first colony to inhabit European settlers, it comes as little surprise that Virginia’s gambling and legal poker betting history dates back further than any other US state. As far back as the early 1600s the early settlers and the Indians tribes would wager on the outcome of athletic events and games of chance by betting real money. The English would also introduce the first card games to North America before real cash poker took off. By 1610 the Commonwealth enacted the first anti-gambling and betting laws, in an attempt to at least control its influence. They ultimately failed. Gambling and real money betting grew throughout the 1700s and into the 1800s. In the latter part of the 19th century more legal gambling laws were implemented, but they too would fail. By the 1920s horseracing gambling became popularized in Virginia, as did pari-mutuel betting, but it wouldn’t be until 1997 that Virginia’s first and only horseracing venue, Colonial Downs in New Kent County  would open to the public. On opening day, more than 13,000 people, most of them Virginia’s real cash betting faithful, poured into the arena. The lottery also has a long and storied history in Virginia, as some of the United States’ first presidents were strong advocates of it and other forms of gambling (but not lawful real money poker betting). However, Virginia didn’t establish its first modern lottery until 1988. Due to Virginia’s strong stance against gambling, it would take over 10 years of political infighting before legislation legalizing the lottery was finally passed in VA. Although several forms of gambling are deemed illegal by Virginia law, the state still boasts a myriad of regulated legit gambling options. In addition to the aforementioned horseracing and lottery, pari-mutuel betting is enjoyed by millions of Virginian residents. Charitable real cash gambling is also legal, at least in some forms, in Virginia. Namely, charitable casino and real money poker nights are not allowed in VA.
Commercial and Indian casinos are not legal in Virginia. However, due to neighboring Maryland’s softened stance on commercial casinos and real cash poker gambling venues and the popularization of online casinos and Internet poker on the east coast, it may not be too long before Virginia’s state officials see the merits of opening a land-based casino or real money poker betting room in Old Dominion. Although Virginia is not interested in legalizing online poker, residents can certainly play at any number of online poker rooms. Virginia’s state officials do not acknowledge poker as a game of skill, and no court seems overly anxious to reconsider real cash poker’s classification. In lieu of this, it appears that online poker and Internet poker games like Texas Hold’em, as well as other forms of iGaming legal real money Internet gambling, will not see the light of day in Virginia anytime soon. To date, no Internet poker bill calling for the legalization of online poker websites has been proposed by VA government, and the prospects of such a legal real money Internet poker bill coming to pass are exceedingly slim. The good news is that Maryland has shown some interest in online gambling and lawful real cash poker websites, and has recently expanded its commercial gambling operations to include five fully fledged casinos and live real money poker venues. And it appears that Virginia might be following suit. In late 2012, a bill was introduced that would create a commission to license and operate casinos and poker betting rooms in Virginia. Not wanting to lose revenue to neighboring states Pennsylvania, Maryland and West Virginia – all of which allow gambling and legit real cash betting – Virginia officials are forced to at least recognize the benefits of opening a casino or live poker gambling facility in National Harbor, 10 minutes outside of Alexandria . That’s not to say any gambling or poker betting bill won’t be met with harsh opposition from select parties, but it’s an encouraging start. High-stakes online real money Internet poker players and brothers Hac and Di Dang originally hail from Virginia. Hac won nearly $3 million dollars playing at online poker website Full Tilt in 2009, and placed 98th in the WSOP Main Event that very same year. He was a regular at the nosebleed stakes of real cash Internet poker games, playing as high as $500/$1000. His brother Di earned $1.28 million in 2007, $3.673 million in 2008 but only a paltry $45k in 2009 . He goes by the Full Tilt Poker handle “Urindanger” on the Internet poker website. If Virginia considers introducing real cash poker gambling into its economy it will likely be in the form of live real money poker card rooms, not online poker websites. Yes, it’s big enough to sustain an online poker operation full of real cash poker players from VA, especially if it forms an interstate Internet poker compact with Maryland, Connecticut, New Jersey or another east coast state in line to launch an iGaming legal Internet poker market. But it appears that Virginia’s officials have little interest in entertaining the thought of online gambling legislation and lawful poker websites revenues. That’s bad news for VA gambling residents, as many of them fit the profile of online poker players who’d enjoy Internet poker. Time will ultimately tell and anything can happen, but it appears that Virginians might have to wait for the Federal Government to chime in before they’ll be able to play legit regulated online poker at legal real money poker websites in VA.